I politely declined. 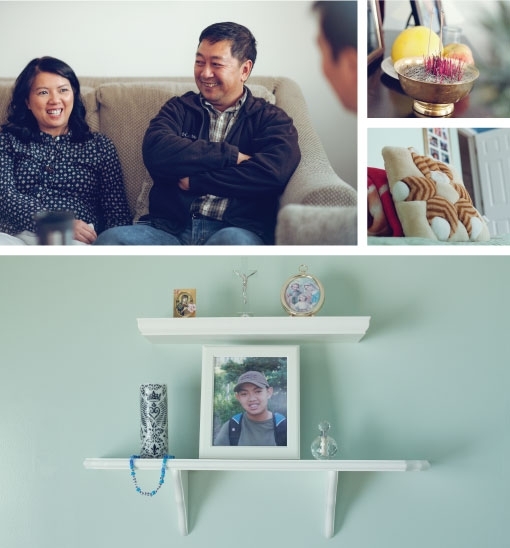 Tung, David’s cousin and the family spokesperson asked, “Would you like to see David’s room”? Photos by: Intellectual Madmen. Collage by Lawrence Guzman. They kept it almost the same as it was the day he died. The bed that once buoyed David body was draped in a blanket colored seafoam green – the same color as the water that hugs Nha Trang, the Vietnamese coastal city that David’s father, Nhuanh, left as a “boat person” for a refugee camp in Malaysia, then a processing center in the Philippines, and eventually, the snow-dusted suburbs of Salt Lake. At the head of the bed lay a pillow embroidered with an orange-and-black striped cat, an appropriate image for a boy nicknamed con meo, or “kitty.” Next to his bed stood a small desk, adorned with a computer that was David’s portal to a world much more grand and inviting than the one he faced in the narrow hallways of Bennion Junior High. A world of REI camping gear (“He knew more than the salesmen,” bragged Tung), of information on surviving in the wild (“He wanted to be a boy scout, but he wasn’t white and Mormon, so instead he went hiking, snowshoeing, and camping with his parents,” said Tung), of a world in need of help from natural disasters like Hurricane Katrina, which inspired him to one day join the US National Guard. “He just wanted to help people,” said his older brother, Don, an undergraduate student at the University of Utah. Nothing is the same without you. You should be here telling us jokes and planning our next camping trip. We should be celebrating your 15th birthday but instead we are grieving your death. The only way we can survive your tragic loss is to hold on to our love for you. Your pride in all things American and compassion for the less fortunate would have helped you fulfill your dream of becoming a National Guardsman. Your polite manners and your kindness illustrated the values your parents instilled in you. You should never been mistreated because of your Vietnamese heritage or because you were gay. You were absolutely perfect the way God made you. After the investigation, we understand the truth and why you felt you had to leave this Earth. We need to bring you JUSTICE and peace by eliminating the hate that you suffered at school by both kids and adults. We are fighting so that other bullied kids get help at school instead of being victimized by those who have a duty to protect them. You deserved better and not a minute goes by without us thinking of you. We miss your handsome face and the joy you brought to our lives. 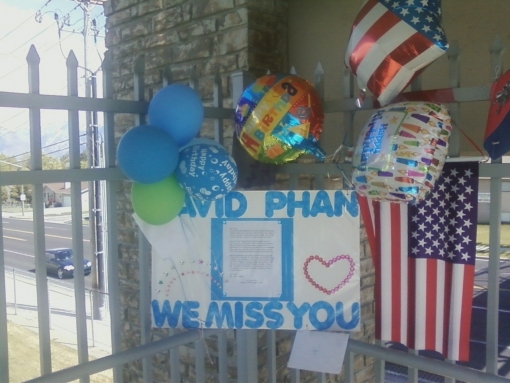 The Phan family has set up an anti-bullying fund in David's memory at Wells Fargo. This fund will go towards anti-bullying education, outreach, and training, as well as a possible annual anti-bullying conference. The Phan family also needs monetary help to recover from David's funeral expenses, which were more than expected. The Phan family has entrusted the author of this article, Terry Park, with receiving donations -- 50% of which will go toward the anti-bullying fund, and 50% of which will go toward the Phan family. You can also mark your entire donation for either the fund or the family. Please PayPal donations to "parkterry [at] gmail.com." Also, if you'd like to express your condolences, support, etc, feel free to use the comment box below. The Phan family would also appreciate the support of individuals and organizations as they go through the litigation process against Bennion Junior High and the Granite School District. Special thanks to Lawrence Guzman for creating the gallery of letters. The gallery may not appear on smartphones and tablets.